I received this book for review thanks to Virtual Authors Book Tours and I choose it just because I had never read a western before and I thought it would be fun. The story begins when Tuck, a young boy who is on his way to his aunt’s ranch, gets caught on a flashflood and is saved by a stubborn cowgirl called Sass. Tuck looses all his goods in the flood, so he has to find a job in order to get money and keep on crossing the country, and he finally happens to work for Sass’ father, Phil. This arrangement makes Sass mad at the beginning, but little by little she becomes less bossy, and even she would stop calling him Dumbass! There on the ranch, Tuck has to do some cattle counting and be sure that there are not fights between white and Mexican cowboys, but what he doesn’t know is that there are some bad guys among the men, and even Phil is scared of them, his own workers. Besides, Tuck starts having strange dreams in which Lost Eagle, an old Indian who lived hidden in those mountains, talks about his destiny. I enjoyed the adventures of this book: the bad guys, the counting on the fields including angry bulls which attack any man they find in their territories; the way Mexicans resolve love problems; the Indian ghost and the wolves howling at nights, etc. Everything was so cinematographic, but the bulk of the book deals with the love story between Tuck and Sass and I found it rather predictable, which is a shame. I would also have liked to know why the ghost appears only to Tuck and not to other people, for example; because it happens just when he begins to work on Phil’s ranch and I think it needs further explanation. You know I always have some downsides for every book I read, but on the whole this western has been perfect for reading after my English exam: fast, entertaining and easy to read. Besides, I would like to point out that this book has a few Spanish words which are correctly spelled, and I can’t say the same about other novels that I have read. 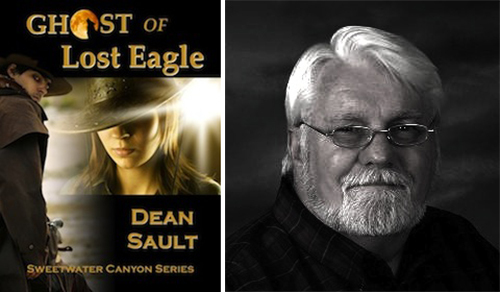 Author Dean Sault is offering $2.00 off of signed print copies and ebooks of Ghost of Lost Eagle, ordered from his website, during the tour. Sounds like an interesting read, but I think the romance would turn me off. Nice review 🙂 I’m glad it was a good thing to read right before your exam! During the exams I always need something light to read, if not, I’m not likely to finish books, is the same there? I’m here trying to write something with sense. I want to practice writing a little and what better way than commenting on your blog in English. The book seems interesting, but I’m reading a book in English and I have other outstanding read. Nube! What a surprise! 😀 You do it very good, my friend! Well, the book is entertaining and light, just what I needed this week. Hope you are enjoying your reads! The romance part is something that would put me off too. I have never read a western before. Guess I would like it, if it was more like a Clint Eastwood movie. Well, this is not like Clint Eastwood, to be honest, but well, it was OK too, just what I expected! Yes, it was exactly that, Mel. Ohh I’ve seen so many Spanish words with have a “ñ” in English books that have just avoided it. And if it has a “ñ” instead of a “n”, it is because they are pronounced different! Cattle is key in a western book. Looks like a fun book. The last “Western” I read was, oh boy, I can’t remember (a read cover, and very funny). Well, not a genre I read a lot, but it is fun once in a while. I’m with you, this won’t be “my” genre, but from time to time it is entertaining! A very fair review 🙂 I’m not keen on the idea of the ghost not being explained if it was needed, but otherwise it sounds a good read. Yes, I would have liked more profound explanation about the Indian ghost; it would have made the book much better. But well, it was OK.